More than 70 of Thanet’s Beavers took part in an annual sleepover during the first weekend of December at Garlinge Primary School. 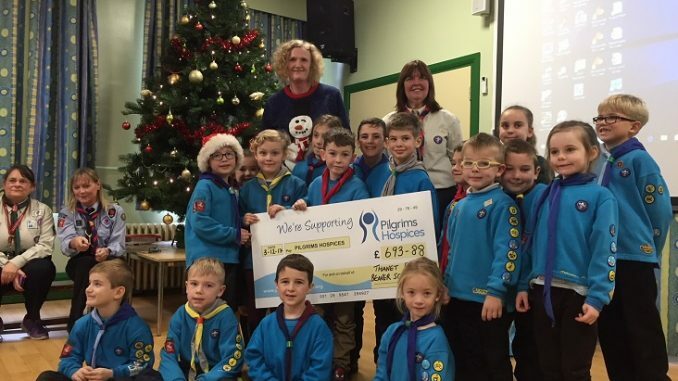 The Beavers, from colonies within Thanet, have been supporting Pilgrims Hospices by undertaking an annual 10K hike, raising an amazing £693.88 this year. The sleepover was the perfect time to celebrate and present their donation. This year’s Christingle and carols service, attended by all the Beavers and many of their families, was led by local minister Peter Russell, who incorporated the cheque presentation with Caroline Dixon, community fundraising officer from Pilgrims Hospice, into the service. The cheque was presented by some of the young Beavers who took part in the event and Sue Cook, Assistant District Commissioner for Thanet District Beavers. Peter then asked the Beavers to share words that best describe Christmas; the youngsters responded with caring, giving, sharing and thinking, only towards the end of the list was presents suggested. Their leaders and parents were so proud that caring was the first word chosen, especially as Pilgrims Hospices is their chosen charity. Sue said: “I have to say that it was the most amazing sleepover where everyone appeared to have a good time. To end with a Christingle service led by Peter Russell was magical and emotional; it was the perfect end to a Christmas sleepover, and a thoughtful start to the lead up to Christmas. Sue also leads the 2nd Garlinge colony and organises the sleepover along with Zena Mays, leader at 1st St Peters Beavers.